Cartwheeling into fall as another summer winds down, I feel profound gratitude for all the year has given me. This particular year has been a challenge, but the way the endless childhood of summer meets the vibrant promise of autumn, I can only celebrate. This time of year has always been a beautiful blank slate for me, a promise, or maybe a subtle, “It gets better,” from the universe.” My surprise at it reminds me of the buoyancy of hope I had as a kid—still have! I cannot imagine a better spiritual reset. Autumn really does arrive emphatically each year, the sharp hooks of summer are turned and released, with the days changing in every way. Air that yesterday felt thick and oppressive, today is cool, somehow thinner. The light shifts and for me, in so many ways, it feels like time is unlocked. I can travel back to Augusts and Septembers that are buried beneath tens of winters. I am 6 and standing at the counter at Sears as my mom buys new pants for me for school, then 8, realizing how swiftly the sun moves behind the hills as they call me in for dinner. Then it’s my turn as the mom, the journey as new as it is familiar. This year is no different. I watched the first birch leaf fall weeks before my birthday, since then a patchwork quilt of leaves have fallen around the ground below. The morning air chides me, “You need longer sleeves” and I walk faster, like I am 5 and playing hot lava on the playground. The sun makes its arc, but moves through our yard at a different pace, the bright swaths of gold are replaced by a subtler beam, with each plant and tree having a shorter turn in the glow. Last night we chased the sun, dashing for the street with bikes, scooters, and helmets clutched to our chests. The driveway was cool beneath our feet and the wall of trees and bushes had begun to thin, leaves dotting the hill. We spilled out onto the street, each clambering onto our own ride, and then careening and whizzing this way and that. Sean was with Fin, his hand finding that familiar spot, fingers cupped and holding the bottom of the bike seat, his other hand on her shoulder. He moved alongside her with his back curved, almost as if he were whispering a secret. 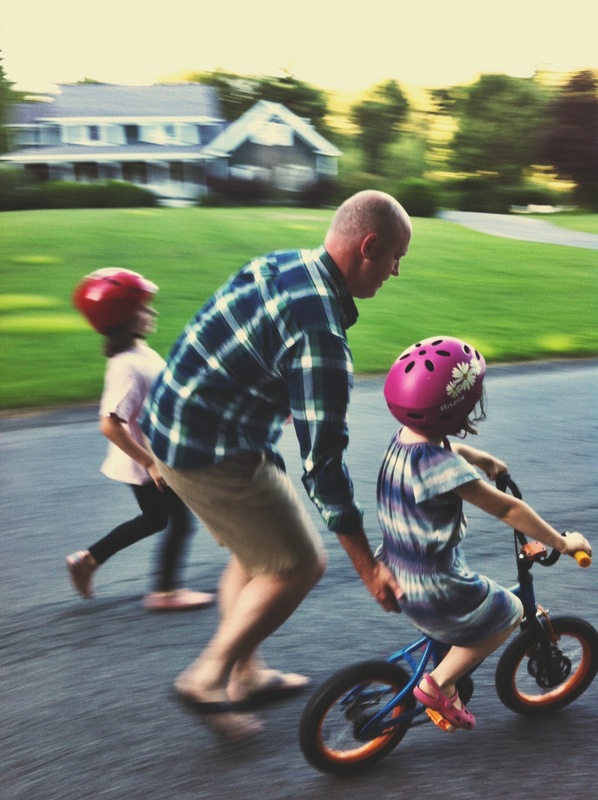 Her sisters, one on a bicycle, the other on foot, followed on either side as he spoke a steady stream of, “Keep pedaling” and “Watch, steer, steer, steer.” I held my camera in one hand and my heart in the other. It was happening, another late summer closing the door on a beautiful chapter. Where has summer gone? This year it feels like it’s gone particularly fast. I love August, how it’s firmly planted in summer yet the air sometimes gets crisper, the possibilities and new beginnings of autumn are just around the corner, the leaves and flowers maturing. Yes, all of this, yes! It always surprises me how I can be so anxious for summer in April and May, and still so ready for fall in August. Another beautiful post, Amanda. You really know how to capture a moment with words. Autumn is my favorite time of year as well. Spring, awful for me, I’m always anxious in spring. But Fall … I too find hope there, and comfort. And yes, we are lucky. I marvel at how often you are cognizant of that. Oh, and my kids? Well, the older is taking driver’s ed this fall. Gulp. Thanks, mama. Remembering the fireplaces and the dancing flames from Onyx and 17th.